Conflicts between humans and elephants, humans and tigers, and humans and orangutans are occurring with increasing intensity each year in Aceh. The main cause of this conflict is the rampant conversion of protected wildlife habitat into massive plantations, both with government permission and illegally. Animals like Sumatran elephants take the annual migration route they’ve been taking for generations and find themselves in barren oil palm plantations. As their habitat shrinks and with no planned safe forest corridors, wild animals are being forced into increasing contact with humans, which they would otherwise avoid. These encounters are often costly: crops are raided, homes are damaged, and lives are lost. Poor land planning is causing humans and wildlife to come into conflict, and when this happens, often both sides lose. 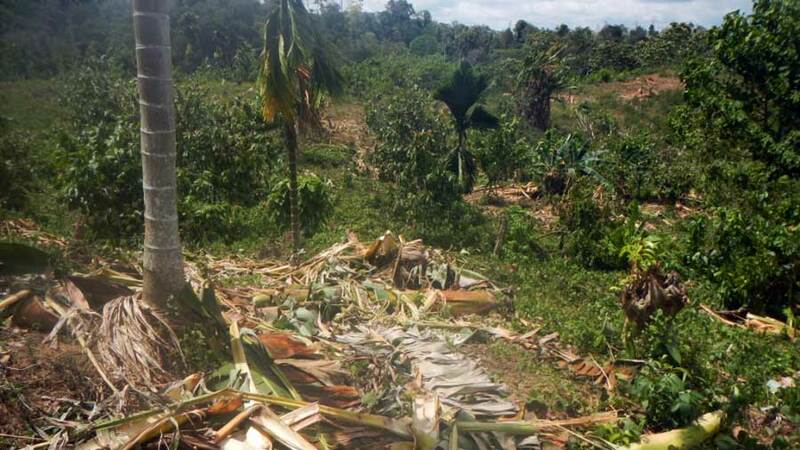 During 2014 at least eight elephants were killed by poison in Aceh plantations by plantation owners. Poachers are also taking advantage of the forest fragmentation by setting traps in plantations to kill the animals and sell their body parts on the black market, or sell infants alive into the illegal pet trade. HAkA works with other partners to facilitate the rescue and safe release of animals encountered in human-wildlife conflict situations. HAkA’s advocacy work involves encouraging the government to conduct land use planning, which takes into account wildlife routes and supports conservation of protected species, while identifying suitable areas for community forestry and development. We are also supporting the completion of formal protocols for handling animal conflict in Aceh. In 2014 at least eight elephants were poisoned by plantation owners.